My palate seems to be changing as I’m traveling and trying new things. I was never much of a beer drinker but the Husband is, and we’ve been including brewery tours in our travels a lot lately, even planning a trip to Asheville, NC, just because of all the breweries. I was always a light beer girl, drinking beer that just barely qualified as alcohol. The more I try different kinds of beer, the more I start to like beer that I swore I would never like. My newest favorite is CB Craft Brewers Canandaigua Lake Ale. It’s an American Pale Ale with an ABV of 5.2%. I’ve never been a hoppy beer person but I seem to gravitate towards them now. 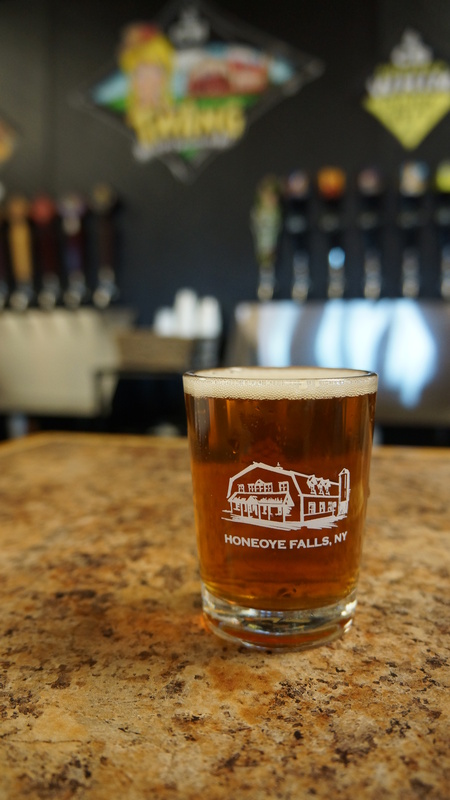 CB Craft Brewers is located in a small town outside of Rochester, NY, called Honeoye Falls, which is part of the Finger Lakes region. Lucky for me it’s not very far from my father’s house, so it’s easy to go to when I’m visiting home. 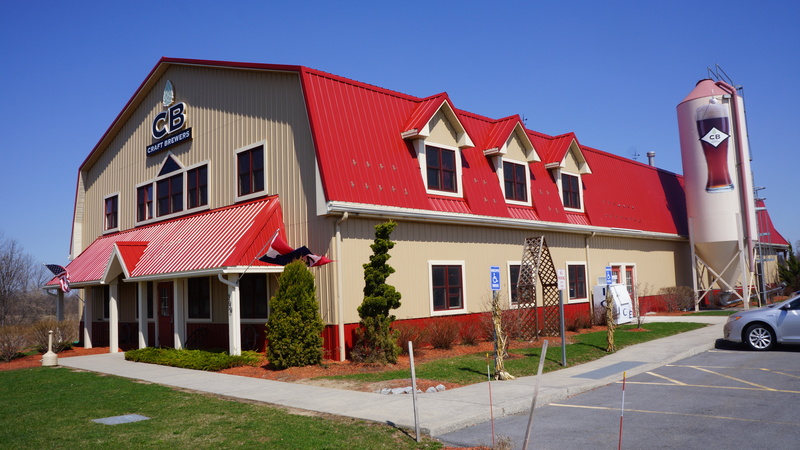 It’s housed in a large red barn and has a great tap room and a pretty decent sized brewing area. 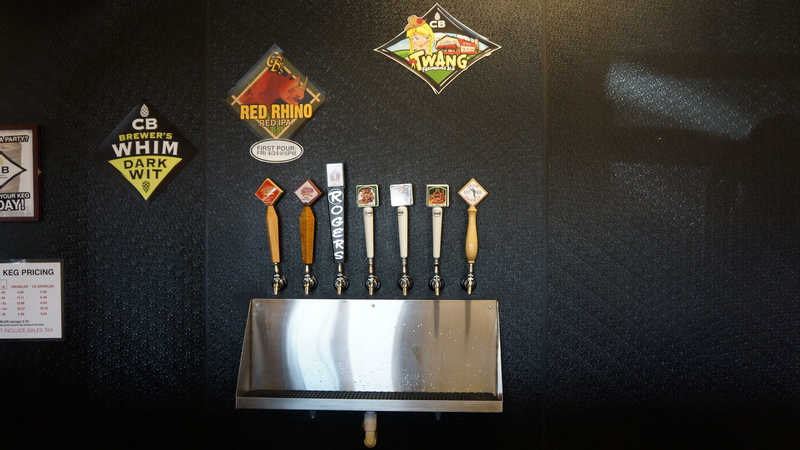 The tap room has 23 beers on tap; include guest brews from other breweries. 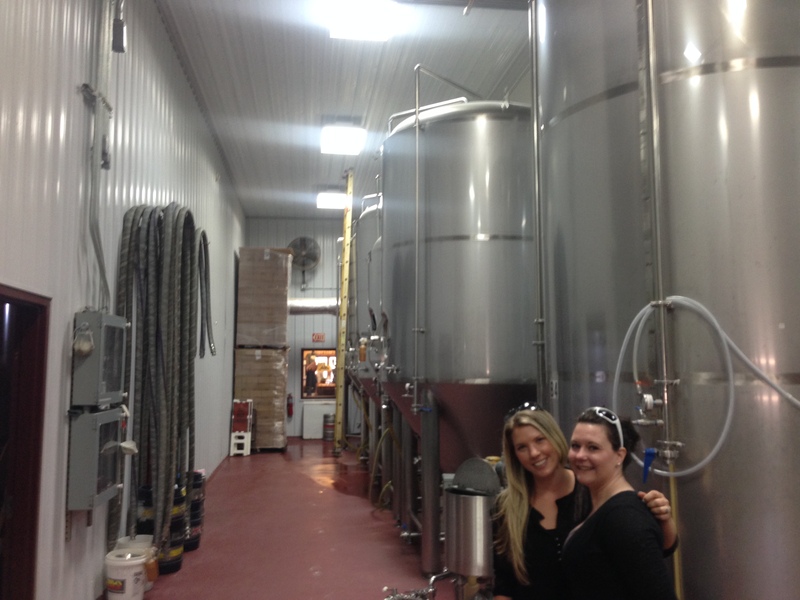 My girlfriend since childhood, Carolyn, visited CB Craft Brewers with me on my last trip to NY. 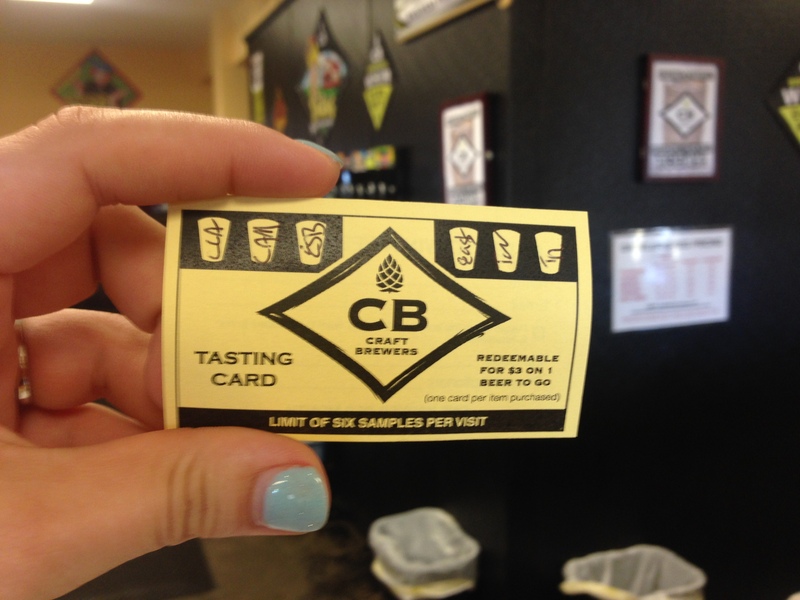 She’s also recently gotten in to breweries and recently visited Pabst in Milwaukee, so she knew the right questions to ask on our tour of CB. 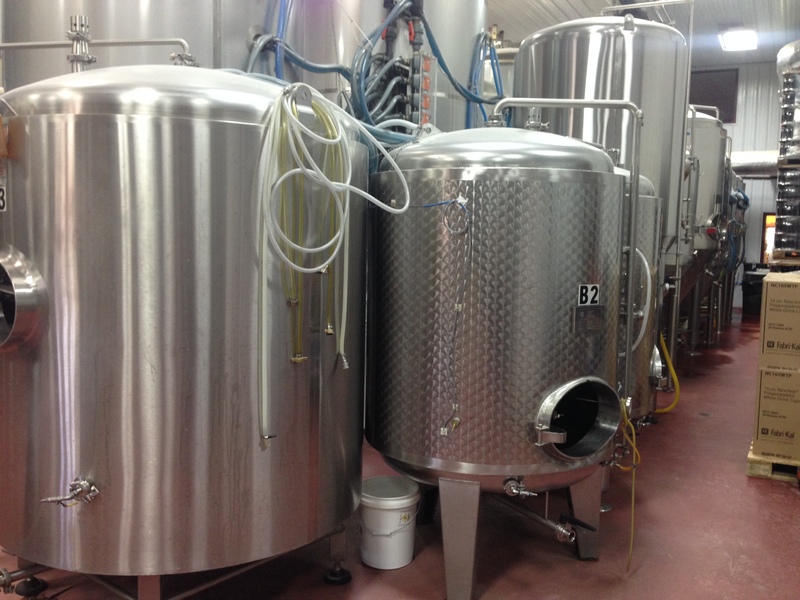 We were lucky enough to get a private tour of the brewing area from a cute young guy named Patrick. He is one of the assistant brewers and you could tell he really loves his job. 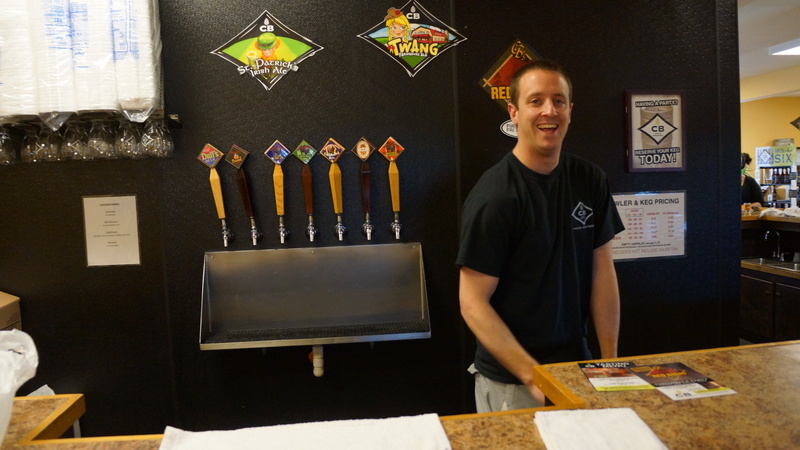 In fact, he said that nearly every part of the brewing process was his favorite. Carolyn and I in the brewery. 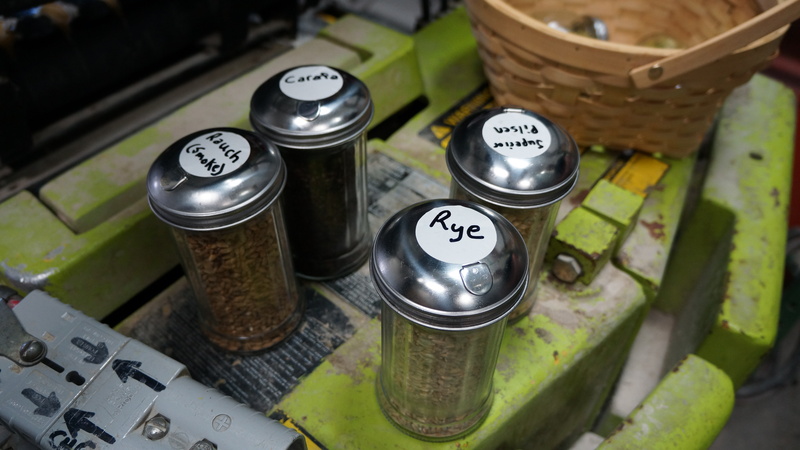 Patrick showed us all the different types of ingredients that go in to their beer, including the barley, wheat, and hops. 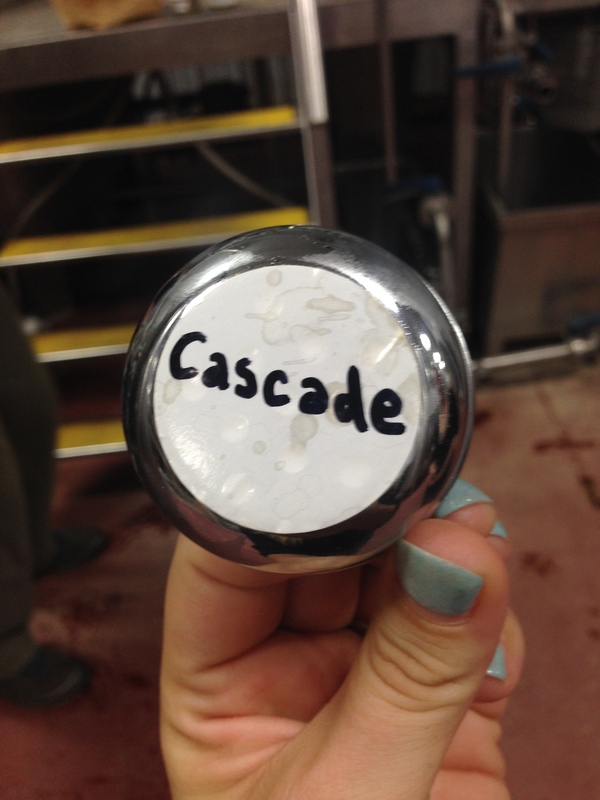 After smelling the different kinds of hops, I learned that cascade hops are the ones that I really like, so I’ll keep an eye out for beers made with them. They are the more floral, citrus hops; still bitter but not offensive to my tongue. 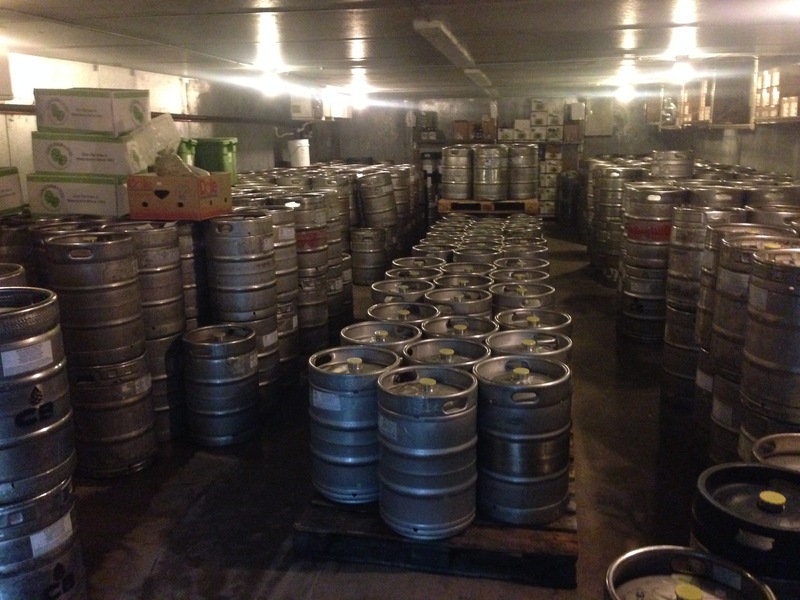 After seeing where the beer is made and stored we headed back out to the tasting room. We had each bought a tasting of six beers, and for $2 I upgraded to a souvenir tasting glass. I knew I wanted the Canandaigua Lake Ale, since it’s my favorite and I can only get it in NY. As for the rest of my samples, I let one of the workers, Dan, pick for me. The main wall of taps. The side wall of taps, and Dan, who picked my samples for me. The other side wall of taps. 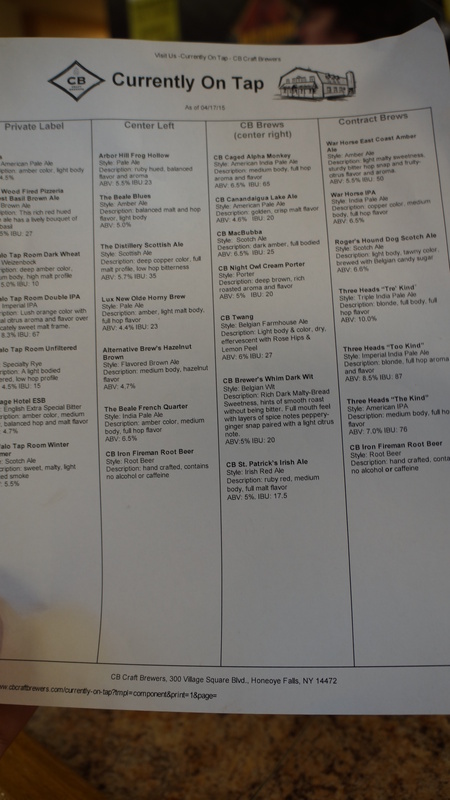 The list of beers available. His first suggestion was the Caged Alpha Monkey. It’s an American Indian Pale Ale with an ABV of 6.5%, and their most popular beer. I was a little hesitant to try it, as the IBU was 65 and I rarely like anything with an IBU over 30 or so. (IBU is the measurement of the bitterness of the beer. The higher the number, the hoppier the beer.) Shockingly, I really liked it. I guess I no longer can say that I don’t like hoppy beers. 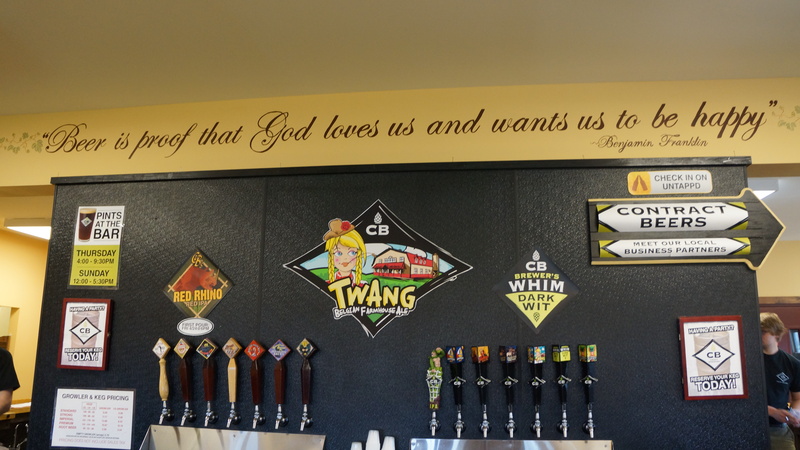 My second favorite was the Twang, a Belgian Farmhouse Ale with an ABV of % and an IBU of 27. It was light in color and has hints of rose hips and lemon peels. It was very similar to a hefeweizen, which is currently my favorite kind of beer. As we continued with our tastings Carolyn discovered that she really likes Scotch Ales. Her favorite beer was Roger’s Hound Dog Scotch Ale, which has an ABV of 6.6% and is brewed with Belgian candy sugar, which gives it a sweet taste. It was a little too sweet for me but I could see having half a pint after dinner, instead of dessert. Carolyn insists we’ve been friends for so long because of our completely opposite tastes. CB also has a little restaurant inside called the Pint and the Goblet. They have delicious sounding appetizers and are known for their burgers. We were in a bit of a hurry, so we didn’t have time to try any of the food. Instead, we ended our visit with some of their Iron Fireman root beer, which was sweet and delicious. 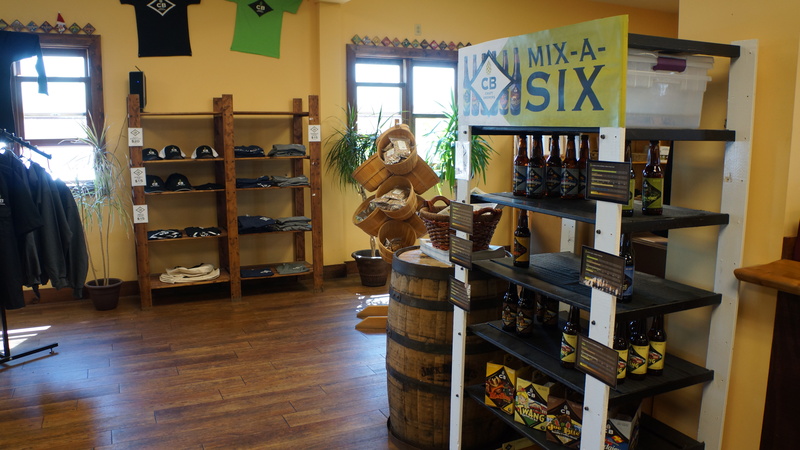 They also have a little store area where you can buy souvenirs, such as beer candles and CB Craft Brewers t shirts. If you find yourself in the Finger Lakes region, it’s definitely worth a stop. The beer is great and the staff is super friendly. 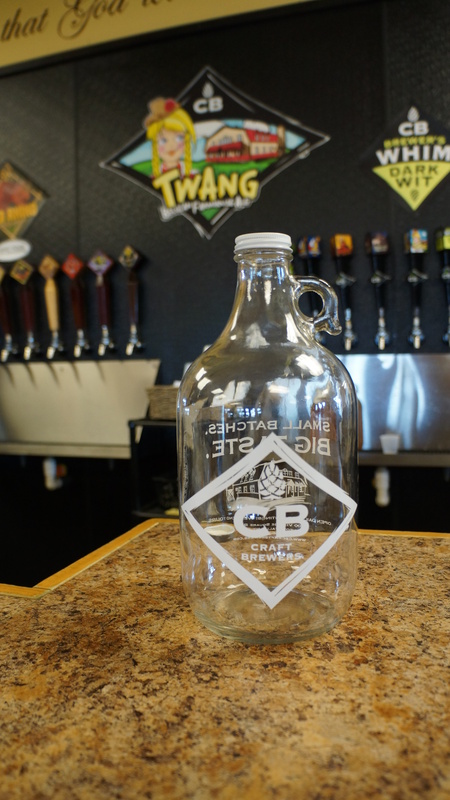 You can take your favorite beer home with you in growlers, which you can purchase there. Of course I got a growler of Canandaigua Lake Ale for myself and one with the Caged Alpha Monkey for my brother. CB growler. This size, for some reason, is illegal in Florida. 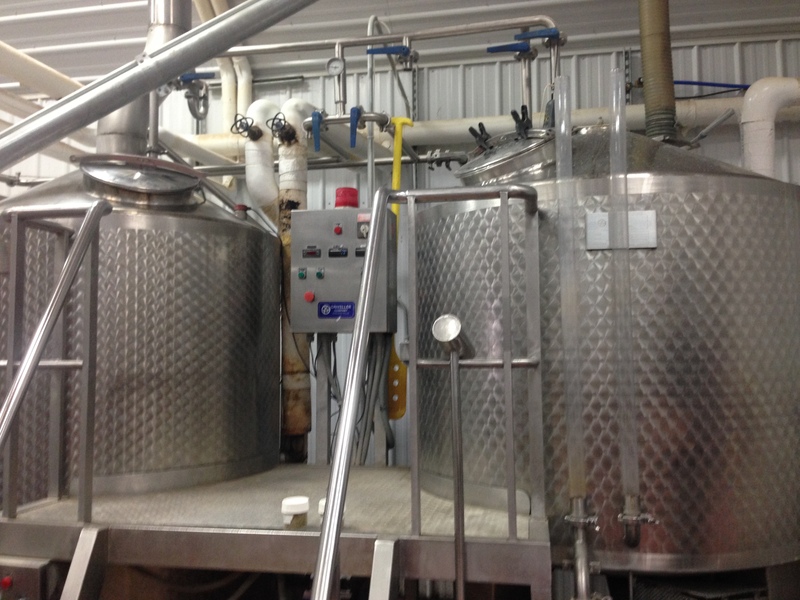 Although the Finger Lakes are known more for their wine, they actually have a beer trail as well. There are breweries from Rochester to Syracuse and down the Finger Lakes. 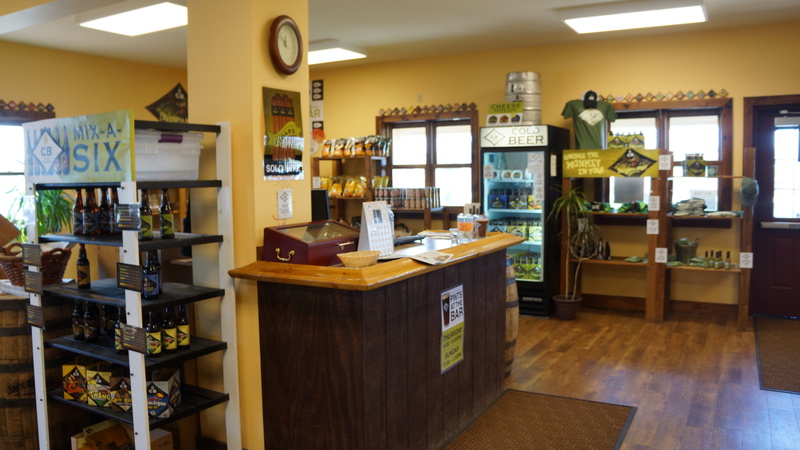 There are maps at the breweries or you can plan ahead with the Finger Lakes Beer Trail. That looks like a good brewery. My wife is slowly starting to like some hoppy beers also. Will you guys be attending “Brews With Attitude” next month? No, we’ll be in Italy! Poor planning, I know. Will you be heading down this way for it? Yes we will. We arrive at Madeira Beach for the final day of the John Levique pirate festival on Sunday May 10th and return home on the 17th. Looking forward to trying the new Mad Beach brewery at Johns Pass. Have a great time in Italy!! Good read! Makes me thirsty for a beer and it’s only 12:30pm. You know what they say: it’s 5 o’clock somewhere! Cheers! And thanks for reading!